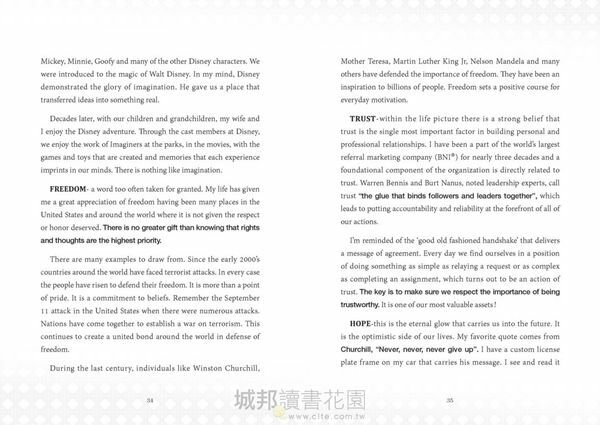 A Book with Chinese treasured wisdom of being leaders and advisers. The first book published in both Chinese and English in the history of book publishing in Taiwan. Learn and understand the brilliant spirit of Taiwanese people. 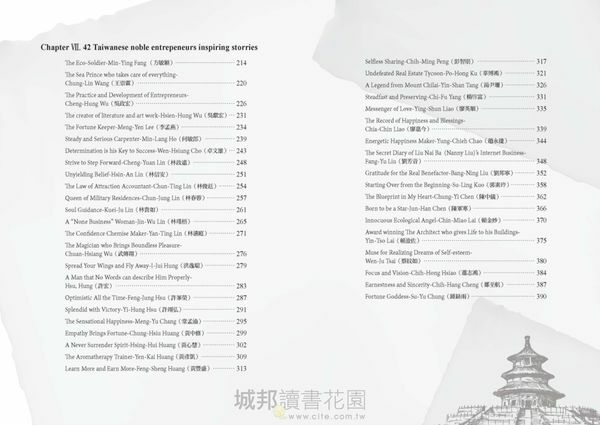 42 Taiwanese noble entrepeneurs’ inspiring stories and their secret for success. 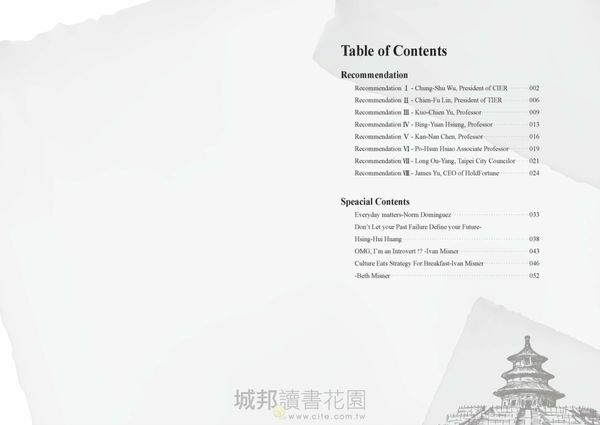 A classical book recommend by the deans of Chung-Hua Institution of Economic Research , Taiwan Research Institute , three economist and two celebrities. 各種組織訓練的絕妙寶典，組織行銷的根本精神，社團運作的巧妙機制，商務合作平台的細膩方法，領導統御的軍師真言。 在台灣，以中文、英文雙語雙冊同步發行全球的第一本書。 台灣式的感動，讓全世界的人都看到台灣人的精神與精彩。 42篇真實激勵故事，年輕學子奮發向上的典範，勇於挑戰者的精闢參考，徬徨無助者的心靈激湯，人生豈有不成功的理由。 台灣兩大智庫(中華經濟研究院、台灣經濟研究院)院長同步推薦，三大經濟學者專家一致讚揚，產官學研各界七位指標人物共同推崇的經典好書 Life is not about getting and having. It’s about giving and being. – Kevin Kruse Special Dedication to: Dr. Ivan Misner® and Beth Misner Mr. Norm Dominguez Andrew Hall and Ji-Hong Hall For Changing the Way the World Does Business® 【名家推薦】 Chung-Shu Wu President of CIER（中華經濟研究院 吳中書 院長） President of CIER( Chung-Hua Institution for Economic Research) Chien-Fu Lin President of TIER（台灣經濟研究院 林建甫 院長） President of TIER( Taiwan Institution of Economic Research) It will be a miraculous leap if this book becomes the best-selling book. This a good book full of the spirit of Taiwan. I urge every Taiwanese people read it thoroughly. Kuo-Chien Yu Professor（劍湖山世界休閒產業集團 游國謙 副董） Present Vice President of JANFUSUN FANCYWORLD CORP. In short this book is rigorous yet lively, elegant yet imaginative. It is highly recommended to give your friend one and keep one for yourself. Put it next to tour bed, read one or two chapters before going to bed. Cleaning your soul and enhance your wisdom .It would be a wonderful deed that everyone should have this book. The truth and the justice is our eternal life guiding stars. It is worthy for more praising. Bing-Yuan Hsiung Professor（台灣大學經濟系 熊秉元教授） Present Professor, Department of Economics, National Taiwan University I am moved therefore I share. I support therefore I recommend. This book is like a beacon. The beacon that lights up the hop for economics breakthrough. And the beacon that shows that ideal purpose of lives. I want to say: We appreciate your devotion. 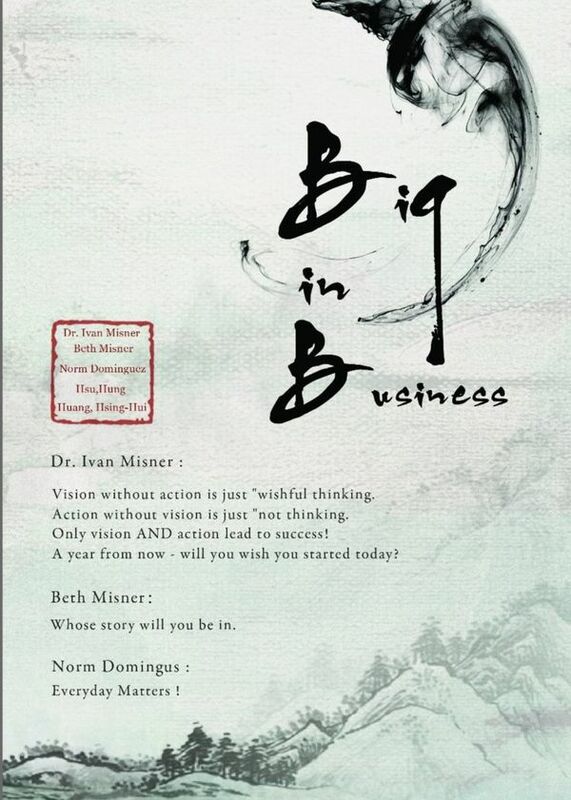 I hope that your influence and spirit as noble entrepreneurs will spread to each corner in Taiwan. Big in Business! I like it! Kan-Nan Chen Professor（淡江大學化學工程與材料工程學系 陳幹男） Present Professor, Department of Chemical and Material Engineering, Tamkang University Work hard and work smart! This I my line! Hsu, Hung realized my words in life that I’m so moved. I recommend this book which has the most energy in the world, for the element that cannot be found in periodictable of the elements, and that is the soul of the success. Po-Hsun Hsiao, Associate Professor（國立台灣體育運動大學 蕭柏勳 副教授） Associate Professor, National Taiwan University of Sport For Hsu Hung and Hsing Hui’s big heart , he can contain all matters worldly; and his humbleness allow him to accept all the goods as well. His heart has no attachment so it is free. The Taste of Huge Business is sweet. Let’s appreciate the taste. Long Ou-Yang Taipei City Council（台北市議員 歐陽龍） To read a book is profitable, especially this one. To seek interests for my people, especially in a huge way. Glorifying Taiwan starts by Business Pioneers. James Yu CEO of HoldFuture The Hsing-Hui I know is a person who never gives up in giving abundant and valuable exchange. She truly believes one’s life must matter. She keeps on giving and walks the talk of helping others. Throughout this book , she has combined her thoughts, and if any story has touched your heart, it is result of her efforts. 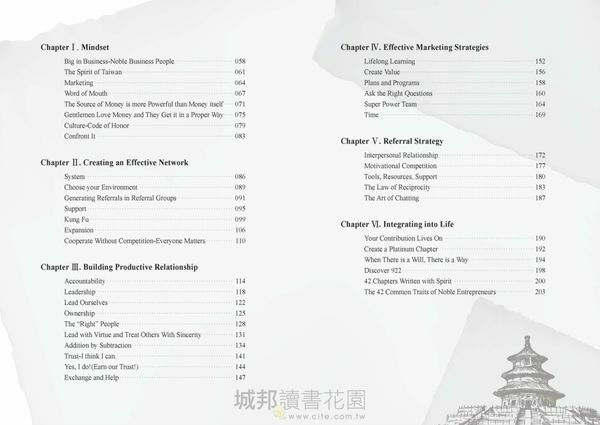 H3 黃心慧(Hsing Hui Huang) 美國Michigan State University Advertising Management 碩士 輔仁大學哲學系學士 文藻外語學院 英文科 是中英文雙語同步深入翻譯的台灣第一人，表情、心境、情緒、身心靈、現場掌控的靈魂式翻譯，這是H3的獨門功法。堪稱雙語活用的天下教主。 現任： 天下英文 執行長 讓台灣被看見運動的推動者、付出者收穫的實踐家、幫助行動的耕耘者、商務引薦平台的雙語精神訓練師、組織心法的成功複製者。 簡歷： 22年英語教學經驗 心慧書院-英語療癒中心負責人 普林斯頓語文短期補習班負責人 專長： 現場同步口譯、英語教學、念力設定教學法、企業競爭力講授、組織學、團隊運作、資源整合、團隊式口碑行銷實戰 特殊語文教學主題： 溝通真有趣、旅遊美語、克服英語學習挫折、你是天才、英文失語症 許宏(Hsu, Hung) 簡稱H2，黃心慧(Hsing Hui Huang) 簡稱H3。H2+H3=H5，這樣的組合堪稱Number1 (N1)，故曰 H5N1。 H5N1將以大商的味道為主題全球巡迴演說，傳授大商心法，讓全世界都能聞到這股來自台灣的芬芳。 Master in Advertising Management Master in simultaneous translation with matching Emotional Level and facial expressions Her spiritual style of interpretation in controlling the mood of the audiences on the spot is her unique power Present serve as: Executive Director of The World English Promoter of the Make Taiwan Seen Movement Practicer of Givers Gain Cultivator Lend a Hand Movement Inspirator of Platforms of Business Referrals Duplicator of Board and Success Organizing Hsu, Hung is abbreviated to H2. Huang, Hsing-Hui is abbreviated to H3. H2+H3=H5 The combination is the best as number 1. Therefore, it is called H5N1. H5N1 will use the topic to give out global speeches. Let the world smell the fragrance of from Taiwan.